The Magnesium ion (Mg2+) is a major intracellular divalent cation. It is an essential mineral for several enzymes, DNA and RNA synthesis, reproduction and protein synthesis as well as a vital coherent controller of glycolysis and the Krebs cycle [1, 2]. Magnesium gluconate (C12H22MgO14) is the organometallic salt of magnesium with gluconic acid produced from glucose catalyzed by glucose oxidase . Magnesium gluconate is found to be the most powerful antioxidant than other magnesium salts and it is useful for the prevention and treatment of many diseases such as cardiovascular diseases, diabetes, allergies, inflammatory diseases, immunological disorders, Alzheimer’s disease, asthma, pre-eclampsia and eclampsia, cancer, etc. [4-8]. It can be used as neuroprotective , for the treatment of oxidative stress induced ischemia/reperfusion injury  and also labor in women arrested initially with intravenous therapy as an oral tocolytic agent . Magnesium gluconate showed the highest bioavailability and most physiologically acceptable salt among other magnesium salts like chloride, sulfate, carbonate, acetate, citrate, lactate, aspartate, etc. [8, 12]. This treated magnesium gluconate mineral can be for the prevention and treatment of various human diseases. Since ancient times, many different cultures, religions and systems of belief have recognized a living force that preserves and inhabits every living organism. This force is the source of ‘life’ and has been called various names, such as prana by the Hindus, qi or chi by the Chinese, and ki by the Japanese. This is believed to correlate with the soul, spirit and mind. This hypothetical vital force has been scientifically evaluated and is now considered the Bioenergetics Field. The Biofield Energy is a dynamic electromagnetic field surrounding the human body, resulting from the continuous emission of low-level light, heat, and acoustical energy from the body. Biofield Energy is infinite, paradimensional and can freely flow between the human and environment [13, 14]. So, a human has the ability to harness energy from the ionosphere of the earth, the “universal energy field”, and transmit it to any living organism(s) or nonliving object(s) around the globe. The object or recipient always receives the energy and responds in a useful way. This process is known as The Trivedi Effect® - Biofield Energy Healing Treatment [15, 16]. Biofield (Putative Energy Field) based Energy Therapies are used worldwide to promote health and healing. The National Center of Complementary and Integrative Health (NCCIH) has recognized and accepted Biofield Energy Healing as a Complementary and Alternative Medicine (CAM) health care approach in addition to other therapies, medicines and practices such as natural products, deep breathing, yoga, Tai Chi, Qi Gong, chiropractic/osteopathic manipulation, meditation, massage, special diets, homeopathy, progressive relaxation, guided imagery, acupressure, acupuncture, relaxation techniques, hypnotherapy, healing touch, movement therapy, pilates, rolfing structural integration, mindfulness, Ayurvedic medicine, traditional Chinese herbs and medicines, naturopathy, essential oils, aromatherapy, Reiki, cranial sacral therapy and applied prayer (as is common in all religions, like Christianity, Hinduism, Buddhism and Judaism) . Biofield Energy Treatment (The Trivedi Effect®) has been extensively studied with significant outcomes in many scientific fields such as cancer research [18, 19], altered antimicrobial sensitivity of pathogenic microbes in microbiology [20, 21], genetics [22, 23], biotechnology [24, 25], altered physical and chemical properties of pharmaceuticals [26, 27], nutraceuticals [28, 29], improved overall growth and yield of plants in agricultural science [30, 31], and changing the structure of the atom in relation to various metals, ceramics, polymers and chemicals in materials science [32-35]. The scientific study indicated that Biofield Energy Healing Treatment (The Trivedi Effect®) might be an alternate method for increasing or decreasing the natural isotopic abundance ratio of the substances [36, 37]. The stable isotope ratio analysis has the wide applications in several scientific fields for understanding the isotope effects resulting from the variation of the isotopic composition of the molecule [38, 39]. Conventional mass spectrometry (MS) techniques such as liquid chromatography – mass spectrometry (LC-MS), gas chromatography – mass spectrometry (GC-MS) are widely used for isotope ratio analysis with sufficient precision . Hence, LC-MS and NMR (Nuclear Magnetic Resonance) were used in this study to characterize the structural properties of the Biofield Energy Treated and untreated magnesium gluconate for the quality control purpose in pharmaceutical and nutraceutical industries. Consequently, LC-MS based isotopic abundance ratio (PM+1/PM and PM+2/PM) analysis in both The Trivedi Effect®- treated and untreated samples was aimed to investigate the influence of The Trivedi Effect® - Consciousness Energy Healing Treatment on the isotopic abundance ratio in magnesium gluconate. Magnesium gluconate hydrate was purchased from Tokyo Chemical Industry Co., Ltd. (TCI), Japan. All other chemicals used in the experiment were of analytical grade available in India. Magnesium gluconate was one of the components of the new proprietary herbomineral formulation, which was developed by our research team and was used per se as the test compound for the current study. The test compound was divided into two parts, one part of the test compound was treated with the Energy of Consciousness by eighteen renowned Biofield Energy Healers (The Trivedi Effect®) and defined as Biofield Energy Treated or The Trivedi Effect® treated sample, while the second part of the test compound did not receive any sort of treatment and was defined as the untreated or control magnesium gluconate sample. The Trivedi Effect® Treatment was provided by the group of eighteen renowned The Trivedi Effect® Energy Healers who participated in this study and performed the Trivedi Effect® Energy Treatment remotely. Eleven Energy Healers were remotely located in the U.S.A., four remotely located in Canada, two remotely located in Finland, and one of which was remotely located in Albania, while the test compound was located in the research laboratory of GVK Biosciences Pvt. Ltd., Hyderabad, India. This Trivedi Effect® Treatment was provided for 5 minutes through the Healer’s Unique Energy Transmission process remotely to the test compound, which was kept under laboratory conditions. None of the Energy Healers in this study visited the laboratory in person, nor had any contact with the compounds. Similarly, the control compound was subjected to a “sham” healer for 5 minutes, under the same laboratory conditions. The sham healer did not have any knowledge about The Trivedi Effect®- Energy of Consciousness Healing Treatment. After that, the Trivedi Effect® Energy Treated and untreated samples were kept in similar sealed conditions and characterized thoroughly by LC-MS and NMR spectroscopy. Liquid chromatography was performed using The Waters® ACQUITY UPLC, Milford, MA, USA equipped with a binary pump (The Waters® BSM HPLC pump), autosampler, column heater and a photo-diode array (PDA) detector. The column used for the study was a reversed phase Acquity BEH shield RP C18 (150 X 3.0 mm, 2.5 µm). The column temperature was kept constant at 40˚C. The mobile phase was 2mM ammonium acetate in water as mobile phase A and acetonitrile as mobile phase B. Chromatographic separation was achieved with following gradient program: 0 min – 5%B; 1 min – 5%B; 15 min - 97%B; 20 min – 97%B; 21 min – 5%B; 25 min – 5%B. The flow rate was at a constant flow rate of 0.4 mL/min. The control and Trivedi Effect® Energy Treated samples were dissolved in a mixture of water and methanol (60:40 v/v) to prepare a 1 mg/mL stock solution. An aliquot of 2 µL of the stock solution was used for analysis by LC-ESI-MS and the total run time was 25 min. Mass spectrometric analysis was accompanied on a Triple Quad (Waters Quattro Premier XE, USA) mass spectrometer equipped with an electrospray ionization (ESI) source with the following parameters: electrospray capillary voltage 3.5 kV; source temperature 100˚C; desolvation temperature 350˚C; cone voltage 30 V; desolvation gas flow 1000 L/h and cone gas flow 60 L/h. Nitrogen was used in the electrospray ionization source. The multiplier voltage was set at 650 V. LC-MS was taken in positive and negative ionization mode and with the full scan (m/z 50-1400). The total ion chromatogram, % peak area and mass spectrum of the individual peak (appeared in LC) were recorded. PM stands for the relative peak intensity of the parent molecular ion [M+] expressed in percentage. In other way, it indicates the probability to A elements having only one natural isotope in appreciable abundance (for e.g. 12C, 1H, 16O, 24Mg, etc.) contributions to the mass of the parent molecular ion [M+]. i.e. the probability to A + 1 elements having an isotope that has one mass unit heavier than the most abundant isotope (for e.g. 13C, 2H, 17O, 25Mg, etc.) contributions to the mass of the isotopic molecular ion [(M+1)+]. i.e. the probability to have A + 2 elements having an isotope that has two mass unit heavier than the most abundant isotope (for e.g. 18O, 26Mg, etc.) contributions to the mass of isotopic molecular ion [(M+2)+]. Table 1. The isotopic composition (i.e. the natural isotopic abundance) of the elements. 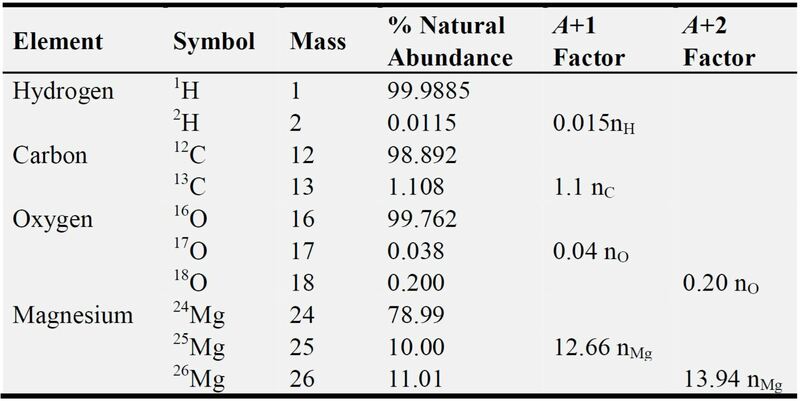 The value of the natural isotopic abundance of the elements used here for the theoretical calculation are achieved from the scientific literature and presented in the Table 1 [43, 44]. Where, IARTreated = isotopic abundance ratio in the Biofield Energy Treated sample and IARControl = isotopic abundance ratio in the control sample. 1H NMR spectra were recorded in a 400 MHZ VARIAN FT-NMR spectrometer at room temperature. Data refer to solutions in D2O with the residual solvent protons as internal references. 1H NMR multiplicities were designated as singlet (s), doublet (d), triplet (t), multiplet (m), and broad (br). 13C NMR spectra were measured at 100 MHz on a VARIAN FT-NMR spectrometer at room temperature. Chemical shifts (δ) were in parts per million (ppm) relative to the solvent’s residual proton chemical shift (D2O, δ = 4.65 ppm) and solvent’s residual carbon chemical shift (D2O, δ = 0 ppm). The liquid chromatograms of the control and Trivedi Effect® Biofield Energy Treated magnesium gluconate are presented in the Figure 1. Figure 1. Liquid chromatograms of the control and Trivedi Effect® Biofield Energy Treated magnesium gluconate. The ESI-MS spectra of the control and treated magnesium gluconate at corresponding the retention time (Rt) are shown in the Figures 2 and 3. The Rt of the mixture of water and methanol (60:40 v/v) was at 2.35 min. Beside this, the liquid chromatogram of the control sample showed two peaks indicating that at Rt of 1.81 and 2.06 min with the peak area% of 61.22% and 38.78%, respectively (Figure 1). On the other hand, the treated sample exhibited also two peaks at Rt of 1.79 and 2.03 min with peak area% of 60.65% and 39.35%, respectively (Figure 1). These findings indicated that the polarity/affinity of the treated sample was unaltered as compared to the control sample. The ESI-MS spectra of the control and treated magnesium gluconate at Rt of 2.06 and 2.03 min (Figure 2) indicated the presence of the mass of magnesium gluconate adduct with methanol at m/z 447 [M + CH3OH + H]+ (calcd for C13H27MgO15+, 447). Figure 2. The ESI-MS spectra (Positive ionization mode) of the control and Biofield Energy Treated magnesium gluconate at the retention time 2.06 and 2.03 min, respectively. Figure 3. The ESI-MS spectra (Negative ionization) of the control and Biofield Energy Treated magnesium gluconate at the retention time 1.81 and 1.79 min, respectively. There was also a peak for the protonated molecular ion at m/z 415 (calcd for C12H23MgO14+, 415) for magnesium gluconate (Figure 2). Figure 4. 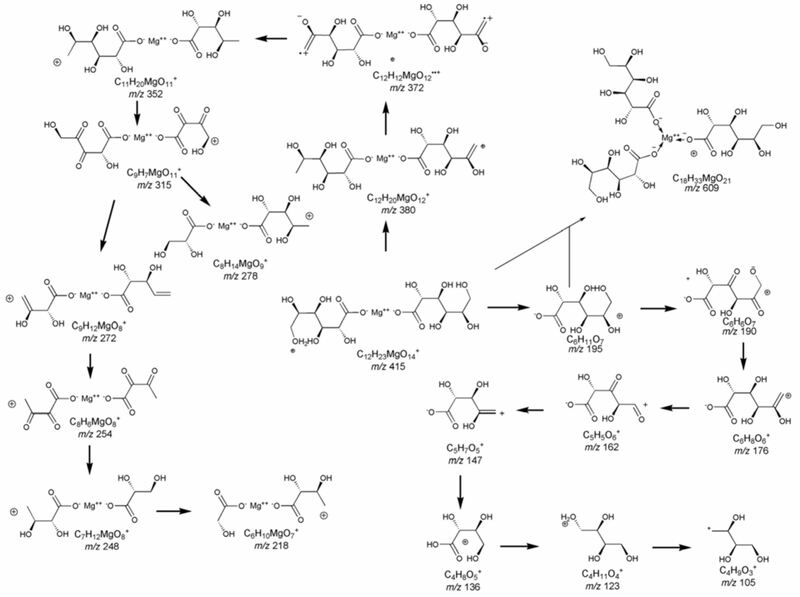 Proposed fragmentation pathway of magnesium gluconate. The pseudo molecular ion magnesium gluconate at m/z 447 displayed 100% relative intensity. The characteristic fragmented ion peaks in the lower m/z region of the magnesium gluconate ion (m/z 415) were observed in the control sample at m/z 380, 352, 279, 272, 255, 190, 161, 147, 135, 121, and 105 due to the successive removal of water, CO and alkyl groups from [M + H]+ and consequently, the internal molecular rearrangement, corresponded to the following ions C12H20MgO12+, C11H20MgO11+, C8H15MgO9+, C9H12MgO8+, C8H7MgO8+, C6H6O7+, C5H4O6+, C5H7O5+, C4H7O5+, C4H9O4+, and C4H9O3+ respectively as shown in Figure 4. The major ions observed in the higher m/z region of the control ESI-MS spectrum (Figure 2) were at m/z 613, 643 and 665. 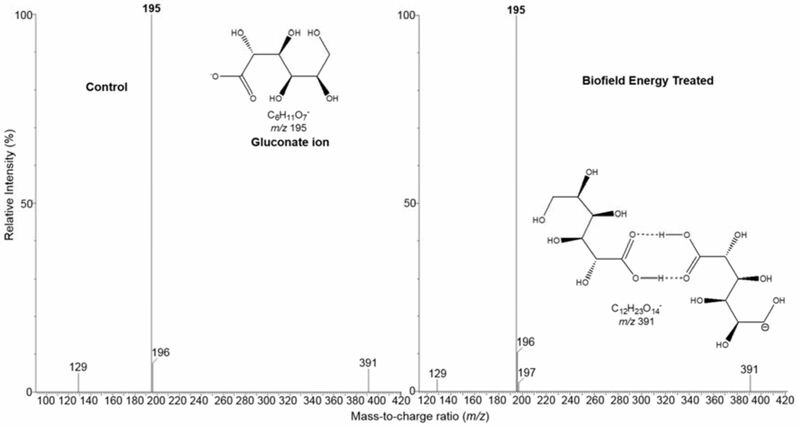 These mass indicated for the mass of the magnesium gluconate chelate with one gluconate ion through coordinate covalent bond (C18H33MgO21, 609) as shown in Figure 4. But it existed in three different pseudo-molecular ions. First pseudo-molecular ion was at m/z 613 [M + 4H]+ (calcd for C18H37MgO21+, 613). The second pseudo-molecular ion was due to the adduct formation with methanol at m/z 643 [M + CH3OH + H]+ (calcd for C19H38MgO22+, 643). The last pseudo-molecular ion was at m/z 665 (calcd for C19H37Mg2O22+, 665) due to the adduct formation of C18H33MgO21 with one Mg++ atom as well as with methanol. On the other hand, the ESI-MS spectrum of the treated sample at the retention time 2.03 min revealed the presence of the protonated magnesium gluconate ion at m/z 415 and 447 as similar to the control sample, but the fragmentation pattern and the relative peak intensities of the treated sample were different from the control sample. The distinctive fragmented ion peaks in the lower m/z region of the magnesium gluconate ion (m/z 415) were noticed in the treated sample at m/z 372, 315, 273, 257, 219, 195, 176, 162, 137, 123, and 105 corresponded to the molecular formula C12H12MgO12••+, C9H7MgO11+, C9H13MgO8+, C8H9MgO8+, C6H11MgO7+, C6H11O7+, C6H8O6+, C5H5O6+, C4H9O5+, C4H11O4+, and C4H9O3+, respectively as shown in the Figure 4. The notable ions observed in the higher m/z region of the treated ESI-MS spectrum (Figure 2) were at m/z 611 and 643 corresponding to the molecular formula C18H35MgO21+ and C19H38MgO22+ that was due to the magnesium gluconate chelate with one gluconate ion. In addition, the ESI-MS of the control and treated magnesium gluconate at the retention time 1.81 and 1.79 min, respectively in the negative ionization mode (Figure 3) indicated only the presence of the gluconate ion at m/z 195 [M]- (calcd for C6H11O7+, 195) with 100% relative peak intensity. In the lower m/z region, a fragmented ion at m/z 129 corresponding molecular formula C6H9O3- and the ion at m/z 391 which was due to the gluconate dimer (C12H23O14-) were also observed in their spectra. In this spectra, there was no alteration in fragmentation pattern of the gluconate ion observed in the control and Biofield Energy Treated samples except only the relative peak intensities. From the above calculation, it has been found that 13C and 25Mg have major contribution to m/z 416. So, PM+2 i.e. 18O and 26Mg contributions from (C12H23MgO14)+ to m/z 417 = 8.92%. The experimental data of magnesium gluconate showed the different value from the calculated value due to the complexity in the structure. LC-MS spectra of the control and Biofield Energy Treated samples indicated the presence of the mass for the protonated magnesium gluconate itself (m/z 415) and adduct form with methanol (m/z 447) in positive ionization mode and the mass for the gluconate ion (m/z 195) in negative ionization mode. Hence, isotopic abundance ratio analysis for magnesium gluconate in the control and Biofield Energy Treated samples were calculated for its two forms i.e. adduct form at m/z 447 and protonated form at m/z 415 along with the gluconate ion at m/z 195. PM, PM+1, and PM+2 for magnesium gluconate ion and gluconate ion of the control and Biofield Energy Treated samples were obtained from the observed relative peak intensities of [M+], [(M+1)+], and [(M+2)+] peaks, respectively from their respective ESI-MS spectra and are presented in the Table 2 and 3. The percentage change of the isotopic abundance ratios (PM+1/PM and PM+2/PM) in the Biofield Energy Treated sample with respect to the control sample is shown in the Tables 2 and 3. The isotopic abundance ratio of PM+1/PM in two magnesium gluconate ion two forms at m/z 447 and 415 in the Biofield Energy Treated sample was significantly reduced by 59.82% and 55.44%, respectively with respect to the control sample (Table 2). Consequently, the percentage change in the isotopic abundance ratio of PM+2/PM was remarkably decreased in the magnesium gluconate pseudo-molecular ion at m/z 447 in the Biofield Energy Treated sample by 78.26% compared with the control sample (Table 2). So, 13C, 2H, 17O, and 25Mg contributions from (C13H27MgO15)+ to m/z 448 as well as from (C12H23MgO14)+ to m/z 416; 18O and 26Mg contributions from (C13H27MgO15)+ to m/z 449 in the Biofield Energy Treated sample were significantly altered with respect to the control sample. Table 2. Isotopic abundance analysis results of the two magnesium gluconate ion forms at m/z 447 and 415 in the control and Biofield Energy Treated sample. PM = the relative peak intensity of the parent molecular ion [M+]; PM + 1 = the relative peak intensity of the isotopic molecular ion [(M+1)+], PM + 2 = the relative peak intensity of the isotopic molecular ion [(M+2)+], and M = mass of the parent molecule. The obtained experimental value (Table 3) for the control sample was almost closed to the above calculated theoretical value. Table 3. Isotopic abundance analysis result of the gluconate ion at m/z 195 in the control and Biofield Energy Treated samples. PM = the relative peak intensity of the parent molecular ion [M+]; PM + 1 = the relative peak intensity of the isotopic molecular ion [(M+1)+], and M = mass of the parent molecule. The isotopic abundance ratio of PM+1/PM in gluconate ion in the Biofield Energy Treated sample was significantly increased by 37.35% with respect to the control sample (Table 3). Hence, 13C, 2H, and 17O contributions from (C6H11O7)- to m/z 196 was enhanced in the Biofield Energy Treated sample compared with the control sample. Where ma and mb are the masses of the constituent atoms. Table 4. Possible isotopic bond and their effect in the vibrational energy in magnesium gluconate molecule. The alteration in the isotopic abundance ratios of 13C/12C for C-O; 2H/1H for C-H and O-H bonds; 17O/16O and 18O/16O for C-O bond; 25Mg/24Mg, 26Mg/24Mg, 17O/16O and 18O/16O for Mg-O bond have the significant impact on the ground state vibrational energy of the molecule due to the higher reduced mass (µ) as shown in the Table 4 that leads to the isotope effects of the molecule. Mass spectroscopic analysis of the several organic compounds revealed that the isotopic abundance of [M+1]+ and [M+2]+ ions were increased or decreased, thereby suggesting the change in number of neutrons in the molecule. It was then postulated to the alterations in atomic mass and atomic charge through possible mediation of neutrino oscillation [46, 47]. It is then assumed that The Trivedi Effect®- Consciousness Energy Healing Treatment might provide the required energy for the neutrino oscillations. The changes of neutrinos inside the molecule in turn modified the particle size, chemical reactivity, density, thermal behavior, selectivity, binding energy etc. . Kinetic isotope effect that is resultant from the variation in the isotopic abundance ratio of one of the atoms in the reactants in a chemical reaction is very useful to study the reaction mechanism as well as for understanding the enzymatic transition state and all aspects of enzyme mechanism that is supportive for designing enormously effective and specific inhibitors [40, 45, 48]. As magnesium is an essential cofactor for various enzymatic reactions, Biofield Energy Treated magnesium gluconate that had altered isotopic abundance ratio might be useful for the study of enzyme mechanism as well as assist in the designing of novel potent enzyme inhibitors. 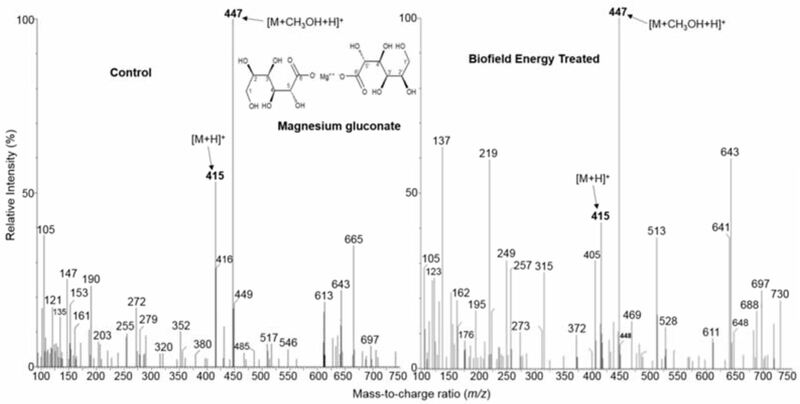 The 1H and 13C NMR spectra of the control and Biofield Energy Treated magnesium gluconate are presented in the Figures 5 and 6, respectively. 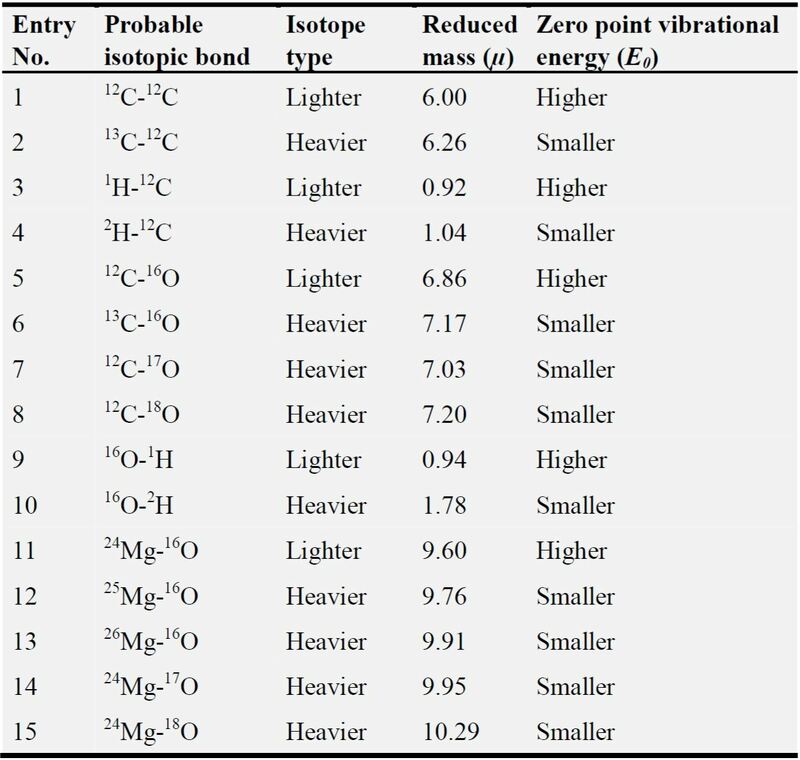 NMR assignments of the control and Biofield Energy Treated magnesium gluconate are presented in the Table 5. Figure 5. The 1H NMR spectra of the control and Biofield Energy Treated magnesium gluconate. Figure 6. The 13C NMR spectra of the control and Biofield Energy Treated magnesium gluconate. Table 5. 1H NMR and 13C NMR spectroscopic data of both the control and Biofield Energy Treated of magnesium gluconate. br- broad, s- singlet, and m- multiplet, * These assignments can be switched. Although magnesium gluconate contains a large number of hydroxyl (OH) groups, the proton spectra of both the control and Biofield Energy Treated samples did not show any signal for the hydroxyl protons. The reason explained by the scientific literature  is that when deuterated water was used as solvent for spectra recording and the hydroxyl protons were replaced by deuterium from deuterated water. The signals for the protons coupling of CH2 group and adjacent CH protons (2-5) in the gluconic acid portion were observed in the range of δ 3.60-4.20 ppm in the proton spectrum of sodium gluconate . From the Table 5, it was found that the 1H NMR spectra of both the control and Biofield Energy Treated samples exhibited the signals for CH2 and CH groups in the range of δ 3.68-4.22 ppm. The carbon signals for CO group, CH2 and CH groups in the 13C NMR spectrum of the Biofield Energy Treated sample were unchanged compared with the control sample (Table 5). It was then concluded that the structure of the magnesium gluconate was remained unaltered due to the Biofield Energy Healing Treatment. LC-ESI-MS analysis indicated that magnesium gluconate in the solution might be existed in situ of three forms, magnesium gluconate, gluconic acid and a chelate form of magnesium gluconate with gluconic acid by coordinate covalent bond. The ESI-MS spectra exposed the presence of the mass for the magnesium gluconate ion in two forms at m/z 447 (adduct form with methanol) and 415 in positive ionization mode and the mass for the gluconate ion at m/z 195 in negative ionization mode. The fragmentation pattern of the Trivedi Effect® Treated magnesium gluconate was found to be different from the control sample. Consequently, the LC-ESI-MS based isotopic abundance ratio analysis revealed that The Trivedi Effect® has the tremendous impact on the isotopic abundance ratios of PM+1/PM and PM+2/PM in the magnesium gluconate ion. The isotopic abundance ratio of PM+1/PM (2H/1H or 13C/12C or 17O/16O or 25Mg/24Mg) in two forms of magnesium gluconate ion at m/z 447 and 415 in the treated sample was significantly decreased by 59.82% and 55.44%, respectively with respect to the control sample. Subsequently, the percentage change of the isotopic abundance ratio of PM+2/PM (18O/16O or 26Mg/24Mg) was remarkably diminished in the magnesium gluconate ion at m/z 447 in the treated sample by 78.26% as compared to the control sample. The isotopic abundance ratio of PM+1/PM (2H/1H or 13C/12C or 17O/16O) in gluconate ion in the treated sample was significantly increased by 37.35% with respect to the control sample. Briefly, 13C, 2H, 17O, and 25Mg contributions from (C13H27MgO15)+ to m/z 448 as well as from (C12H23MgO14)+ to m/z 416; 18O and 26Mg contributions from (C13H27MgO15)+ to m/z 449 in the treated sample were significantly altered with respect to the control sample. 13C, 2H, and 17O contributions from (C6H11O7)+ to m/z 196 was enhanced in the treated sample in comparison with the control sample. The treated sample might exhibit isotope effects such as altered physicochemical and thermal properties, rate of the reaction, selectivity and binding energy due to its changed isotopic abundance ratios of PM+1/PM and PM+2/PM as compared to the control sample. The treated magnesium gluconate might be helpful to understand the enzymatic reactions as well as design the novel potent enzyme inhibitors by using its kinetic isotope effects. Besides, The Trivedi Effect® - Consciousness Energy Healing Treatment could be a useful approach in the design of better nutraceutical and/or pharmaceutical formulations that can offer significant therapeutic responses against various diseases such as diabetes mellitus, allergies and septic shock, stress-related disorders like sleep disorder, insomnia, anxiety, depression, Attention Deficit Disorder (ADD), Attention Deficit Hyperactive Disorder (ADHD), mental restlessness (mind chattering), brain frog, low libido, impotency, lack of motivation, mood swings, fear of the future, confusion, migraines, headaches, forgetfulness, overwhelm, loneliness, worthlessness, indecisiveness, frustration, irritability, chronic fatigue, obsessive/compulsive behavior and panic attacks, inflammatory diseases and immunological disorders like Lupus, Systemic Lupus Erythematosus, Hashimoto Thyroiditis, Type 1 Diabetes, Asthma, Chronic peptic ulcers, Tuberculosis, Hepatitis, Chronic active hepatitis, Celiac Disease (gluten-sensitive enteropathy), Addison Disease, Crohn's disease, Graves’ Disease, Pernicious and Aplastic Anemia, Sjogren Syndrome, Irritable Bowel Syndrome (IBS), Multiple Sclerosis, Rheumatoid arthritis, Chronic periodontitis, Ulcerative colitis, Chronic sinusitis, Myasthenia Gravis, Atherosclerosis, Vasculitis, Dermatitis, Diverticulitis, Rheumatoid Arthritis, Reactive Arthritis, Alopecia Areata, Psoriasis, Scleroderma, Fibromyalgia, Chronic Fatigue Syndrome and Vitiligo, aging-related diseases like cardiovascular disease, arthritis, cancer, Alzheimer’s disease, dementia, cataracts, osteoporosis, diabetes, hypertension, glaucoma, hearing loss, Parkinson’s Disease, Huntington’s Disease, Prion Disease, Motor Neurone Disease, Spinocerebellar Ataxia, Spinal muscular atrophy, Amyotrophic lateral sclerosis, Friedreich’s Ataxia, Lewy Body Disease, chronic infections, and much more. A: Element; LC-MS: Liquid chromatography-mass spectrometry; GC-MS: Gas chromatography-mass spectrometry; M: Mass of the parent molecule; m/z: Mass-to-charge ratio; n: Number of the element; NMR: Nuclear magnetic resonance spectroscopy; PM: The relative peak intensity of the parent molecular ion [M+]; PM+1: The relative peak intensity of isotopic molecular ion [(M+1)+]); PM+2: The relative peak intensity of isotopic molecular ion [(M+2)+]); Rt: Retention time. The authors are grateful to GVK Biosciences Pvt. Ltd., Trivedi Science, Trivedi Global, Inc. and Trivedi Master Wellness for their assistance and support during this work.